Astronomer and photographer Julien Girard drew the heart in the air with a tiny flashlight at ESO's Paranal Observatory in northern Chile. The VLT telescopes are barely visible on the hill at lower right. This photo was taken on Oct. 20, 2011 and released by ESO officials on Feb. 13, 2012. A veteran astronomer has sent our Milky Way galaxy the ultimate love letter by snapping a portrait of the galaxy nestled inside a neon-like heart in fitting cosmic card for Valentine's Day. The photo was taken by astronomer and photographer Julien Girard, who works at the European Southern Observatory in Chile. It shows the night sky above ESO's Paranal Observatory in northern Chile, with an artificial pink heart around the Milky Way. 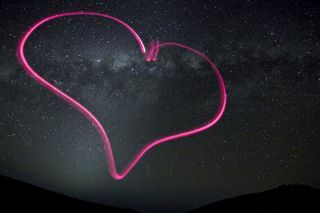 "Girard drew the heart in the air by shining a tiny flashlight keychain at the camera during a 25-second exposure with a tripod," ESO officials said in a statement on Monday (Feb. 13). ESO officials unveiled the photo on Monday, though Girard actually created the image in October. In the space Valentine's Day photo, the central portion of our Milky Way is tucked inside the middle of Girard's pink heart. Several stars from the Southern Crown constellation (also known as the Corona Australis) create an arc of jewel-like lights across the top of the heart's left lobe, ESO officials said. An odd glow to the left of the heart's lowest point is a phenomenon called zodiacal light, which occurs when sunlight is scattered by dust particles in our solar system. Girard's heart and the Milky Way galaxy aren't the only stand-outs in the photo. The 8.2-meter telescopes of ESO's Very Large Telescope facility also appear on the ground at the far right of the image. The telescopes can be seen as silhouettes atop the mountain Cerro Paranal, ESO officials said, adding that the headlights of a car making the trip down from the observatory are also visible. While space photography may be a passion for Girard, he works primarily as an instrument scientist for an adaptive optics system on the Very Large Telescope's Unit Telescope 4. Adaptive optics is a telescope technology that uses adjustable mirrors to filter out the interference of Earth's atmosphere during night sky observations.